Categorized under: Forms Based Authentication, Sharepoint. Tagged with: change password, CKS Forms Based Authentication Solution, FBA Pack, Forgot Password, register, role management, SharePoint, SharePoint 2007, Sharepoint 2010, SharePoint 2010 FBA Pack, SharePoint 2013, SharePoint 2013 FBA Pack, user management, web part. Does this work on Windows Server 2008 R2 SP1? My webaplication having Claim based authintication using active directory membership. Unfortunately I haven’t heard of anybody successfully using this with the active directory membership provider. It’s only been tested with the sql membership provider. Theoretically it should work with any provider that fully implements the membership provider interface, but unfortunately the standard active directory/ldap membership providers do not. Either the FBA Pack would have to be modified to work specifically with these membership providers, or a custom membership provider would have to be created based on the existing ldap/ad membership providers that fills in the missing functionality. I installed it and configure on website. But somehow review user request not working. Can I have some more detailed for the same. I am new for Share Point. Any help will be greatly appreciatedbgh. On the FBA Site Configuration page, make sure that ‘Review Membership Requests’ is checked. Also, make sure that email has been properly configured in SharePoint. The web parts won’t work without it. As long as both of those things are done, the user should get a ‘Membership Pending’ email when they sign up using the membership request web part. Admins should then be able to see the user in the Membership Review list and approve the user. When that is done, the user will get a ‘Membership Approved’ email. If you could make this work with AD you would have something alot of people would want 🙂 ADFS lacks in the arena of password reset big time! Agreed. An AD enabled change password and reset password are actually on the roadmap – it’s just a matter of getting the time to develop them. I have installed FBA pack in sharepoint 2013. I have develop a custom Login Page and i have a password recovery Link on the Login Pgae. How to Add Password Recovery Webpart(given by FBA Pack)to my Password Recovey Link. I want to add two new fields in NewUser Form while creating the new FBA user(Title and Department). My Requirement is to show the department and title in Sharepoint People Picker like When SP Picker picks the AD users and it shows the designation,same I want to show for the FBA users. You’ll have to modify the FBA Pack to add those two fields to the form, and then update SharePoint’s Title and Department fields. Just copy the code for how it’s done for the user’s name and email address. How to modify the pack to add extra fields? When a FBA-User logs in for the first time, Sharepoint create a User in the „User Profile Store“. In this scale, the e-mail adress will not transferred. During the next synchronization of the profiles with the local user information lists, the e-mail address on the “local users” will be overwritten with the empty value on the profiles. Consequently, no more e-mails can be sent to these FBA users on Nintex and SharePoint. 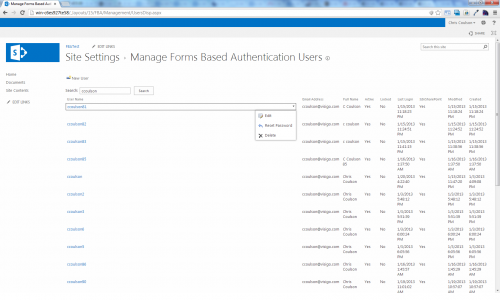 I haven’t used Nintex before – but you’re correct – if a user logs in to SharePoint with an account that exists in the membership database but not the site collection, it will create an empty SharePoint user profile for them on the site collection. The new profile will only contain the user name. That profile would then have to be edited to add the user’s full name and email address. 2) if you have a central location of user profile details, create a powershell script that updates the site collection user profiles with the details, and just set it to run on a schedule (once a day, once an hour – however often it is needed). Do you have already a powershell script, that update the site collection users? Is there any chance this will work with SharePoint online (Office 365)? Based on the documentation I’ve read, I’m going to guess that no, it won’t but thought I should ask in case I overlooked something. Thanks a lot, very cool project (and very useful!). I haven’t tried it, but as far as I know there is no way to setup FBA using a SQLMembershipProvider on Office 365. I also believe that custom solutions added to Office 365 have to be either sandboxed solutions or apps, and this is neither. I am having an issue on the FBA 2013 pack. When I click on FBA User and Role Mgmt under my site settings, getting an authentication provider not configured correctly message. FBA is working, and everything else as far as I can tell, have went through documentation on both FBA config and FBA pack and think I got it as far as I can tell. Have tried undeploy/redeploy and activate but no luck so far. Any ideas? If FBA is working and you can login via FBA, but you’re getting that message when accessing the management pages, then likely your SecurityTokenService membership provider settings are ok, but there’s an issue with the membership provider settings for your web application (web.config for web application or machine.config). Other possibility is that the web application and SecurityTokenService app pool’s run under different accounts – and only the SecurityTokenService app pool account has permissions to access the membership database. You the man Chris! Same id, just did not have proper permission in the membership db. Hey Chris – I cannot get new registrations to go into approval queue. If I login with AD user and test email notifications after changing a file, i get an email so I have to assume email routing is configured properly. Any ideas why new registrants aren’t being queued in membership approval section? I think I have confirmed email routing is functional. Any ideas or places to look for further information? It could be that email is working for internal addresses only, and people are signing up with external addresses (gmail etc…). If that’s the case, your mail server has to be configured to allow SMTP Relaying from the SharePoint server. 1. Firstly the Change Password Webapart, I am not able to get the newly generated password, the new generated password must be saved on to a list in Sharepoint in the same site, but i am not able to get. 2. Next issue, can I change the tag name in Site Settings for FBA Membership Request Management, FBA User Management, FBA Role Management, FBA Site Configuration. 1. When the user changes their password with the change password web part, the password is stored in the membership database (default db name is ‘aspnetdb’). Depending on the settings for the membership provider in your config file, the password will be either in plain text, encrypted or hashed (recommended). If it’s hashed you will not be able to read the password. 2. I’m not exactly sure what you mean by tag name. All of the strings for the FBA Pack that are displayed are stored in the resource files (.resx), if you would like to edit them. Yes, you will have to use the 2013 FBA Pack – as the site collection is actually running on SharePoint 2013, just in SharePoint 2010 experience mode. I cannot deploy 2013 FBA pack on SharePoint 2010 site collection/content DB running in 2010 experience on 2013 SharePoint Server. I keep getting “The feature is not a farm level feature” error. If there is some documentation that supports this that would be great. Thanks! Where are you getting the “The feature is not a farm level feature” error message? Are you trying to deploy it to Central Admin? It needs to be deployed to a site collection. Alternatively, just run .\deploy in powershell, and then activate the Forms Based Authentication Management feature in the site collection feature list. I was using SP 2013 Management Shell to .\deploy FBA pack to the web application which contained site collections that required to stay in the 2010 experience and got the error. The 2013 FBA pack will not work for site collections in 2010 experience, only the 2010 FBA pack. I wouldn’t deploy FBA pack to Central Admin that should stay windows based IMO. Once I was able to deploy the 2010 FBA pack, I had to modify the web app’s web.config to bind the 2010 identity model as a dependent assembly. Strange but so far so good. Looks like I had to deploy the 2010 FBA pack for the site collection running on the SP 2010 experience. I just had to bind an assembly reference to the elder SharePoint Identity model in web.config so that the password change didn’t throw an error. Still testing it out. First of all, this is a great pack..!! Thanks for your effort. I have FBA 2010 pack installed in a site (SP2010 mode) running in SP2013 environment. Recently we did visual upgrade on the site. Now FBA 2010 pack is not working, as it is expecting all the FBA Web Pages in “\15” hive. So we are in the plan to upgrade FBA 2010 pack to FBA 2013 in the recently upgraded SP2013 site. Do you have a list of steps that we need to follow for replacing (or upgrading) FBA 2010 with FBA 2013 pack? We need all the FBA User accounts and their details (Full Name, IsInSharePoint, Email, etc.) to stay intact as this site is currently being accessed by many external users. Please help. I haven’t tested it with SP 2010 compatibility mode on 2013. I would suggest just removing the 2010 FBA Pack and installing the 2013 FBA Pack, which is identical to the 2010 FBA Pack, but made compatible with 2013. Also, just a note, the FBA Pack doesn’t actually affect how FBA accounts are setup in SharePoint, it simply provides tools for managing them. When you’re setting up the 2013 server, as long as you use the same membership provider name as was used in 2010, they should transfer over seamlessly. If you end up changing your membership provider name, SharePoint won’t recognize the user as an existing user and you’ll have to migrate the usernames. Can this product support FBA with an LDAP Provider? I already have a working FBA with LDAP, but would like to utilize you templates. Receiving error message that my FBA is not configured. In theory it should, as it just operates against the standard Microsoft membership provider interface. Unfortunately in reality it does not, at least not with the built in LDAP/AD membership providers. Unfortunately the built in providers for LDAP don’t fully implement the MS membership provider, so as a result the FBA Pack does not work with it. I would like to know how to update the FBA pack to the last version using Power Shell Scripts. Application error when access /_layouts/15/FBA/ChangePassword.aspx, Error=The file ‘/_layouts/FBA/WEBPARTS/ChangePasswordWebPart/ChangePasswordTemplate.ascx’ does not exist. From the error it looks like the FBA Pack didn’t complete deploying properly – it can’t find one of the files that is included in the deployment. I’d rerun the ./deploy.ps1 script on the SharePoint machine, which will undeploy and then redeploy the solution. Thanks Chris. I have taken latest WSP from download and deployed and it works fine now. Earlier, I downloaded source code and create package and used. Seems like either the source code is not updated or missing reference of file as you mentioned earlier. I would like to know if the user database is compatible with a SQL 2014 AlwaysOn cluster configuration? I haven’t tested it, but I don’t see why it wouldn’t be. I already have fba working on a site. I want to add the User Management features. Can I do that with the FBA Pack? Just run the Activate script?